TRANSFORMATION AWAITS was written by Rachel Goldberg and Jonathan Pope Evans. It is being produced by Triangle Road Entertainment in conjunction with Meredith Littas. The feature screenplay is based on the award-winning short film, NEIGHBORS, which was created through AFI’s Directing Workshop for Women. The screenplay was selected for the highly competitive Film Independent Screenwriting Lab where it was developed under the guidance of Jeff Stockwell (DANGEROUS LIVES OF ALTAR BOYS), Kirsten Smith (LEGALLY BLONDE) and Damien Chazelle (WHIPLASH). The script was also supported by the Sundance/Women in Film Financing Initiative under the guidance of Cassian Elwes (DALLAS BUYERS CLUB), Amy Baer (LAST VEGAS) and Sundance Executive Director, Keri Putnam. 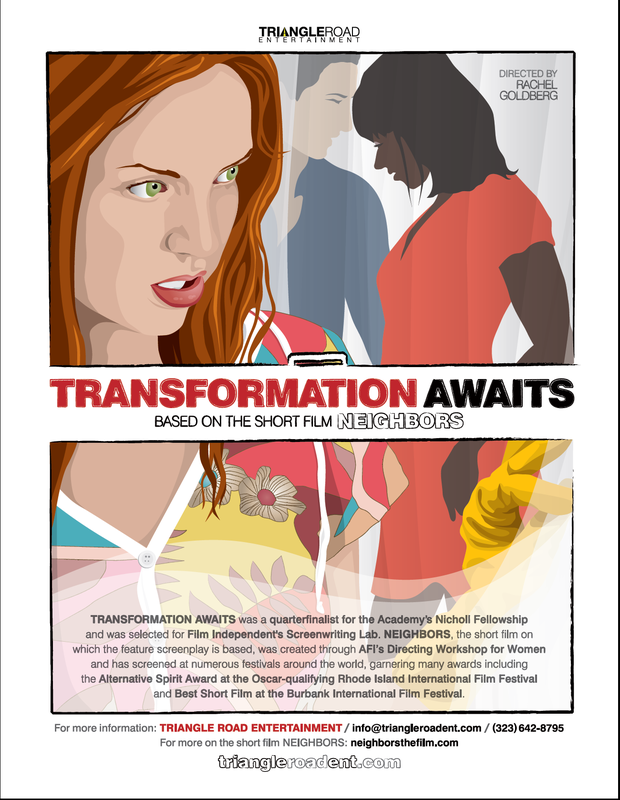 TRANSFORMATION AWAITS won a Grand Prize in Screenwriting at the Rhode Island International Film Festival, was a quarterfinalist for the Academy’s Nicholl Fellowship (placing it in the top 5% of over 7500 scripts), and was top 5 for the Cinestory Screenwriting Fellowship.